The GP after renovation in 2010, now minus the indicators. 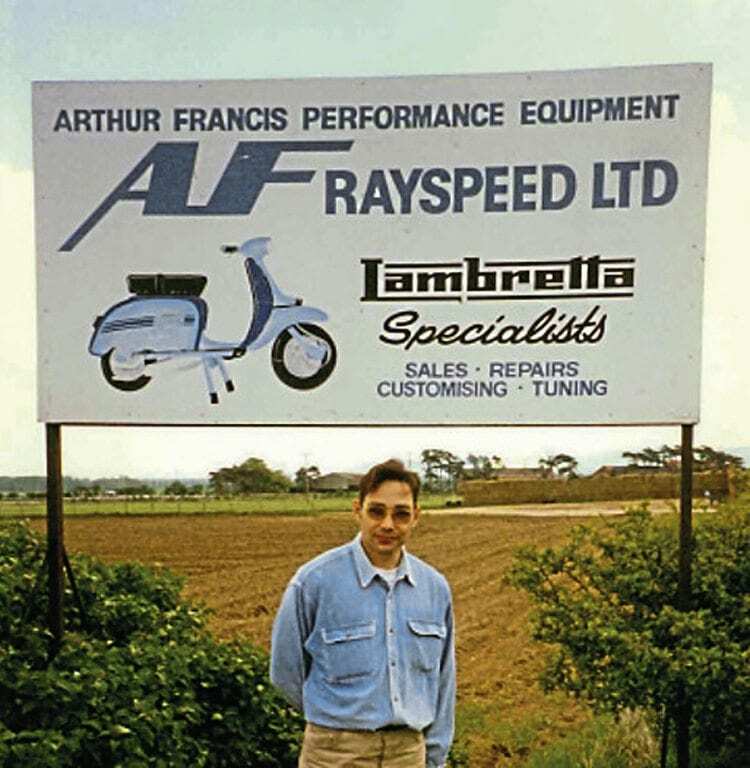 James King first purchased his brand new Lambretta from AF Rayspeed in the summer of 1997 and to this day still owns it. There can be very few people who can possibly make the same claim. 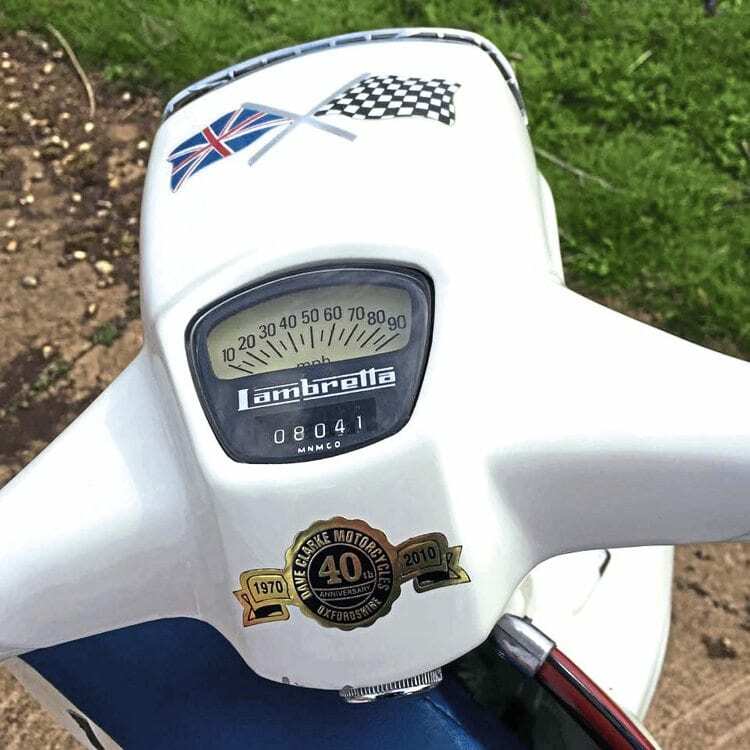 It shows both a great passion and loyalty to the great Lambretta design, one that James has held for many years. James’ first foray in to the Lambretta world was not the usual route one would expect to take. Rather than buy one, he acquired a rather tatty but running LD from his local tip in the early 1980s. Even so, it was enough to get him bitten by the Lambretta bug. Soon afterwards he purchased a J 125 Starstream, by all accounts doing it correctly this time by purchasing it from a shop. 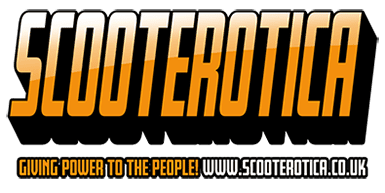 After a period of being involved in the scooter scene, James like many left only to return again at a later date. 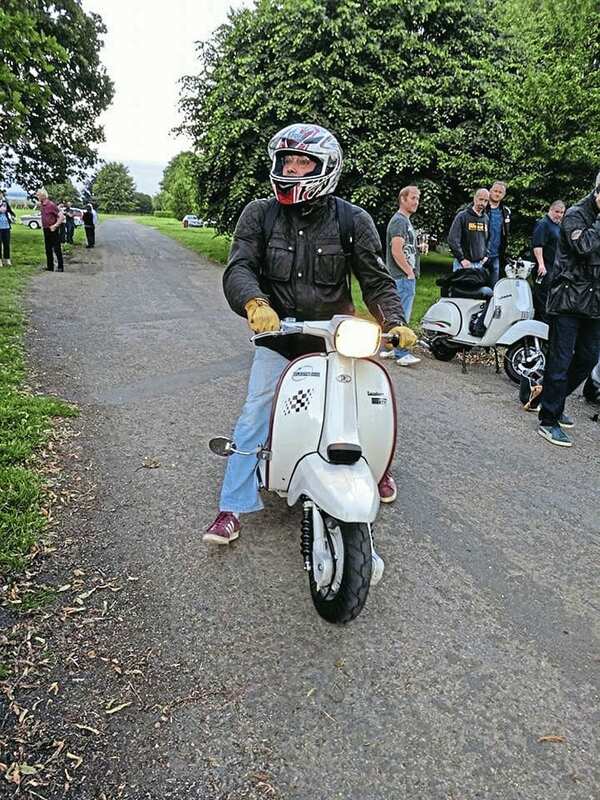 Fast forward to 1996 and James once again decided to plunge in to the scooter scene and become a Lambretta owner once again. James posing in front of the famous shop sign on the day he became the owner of his GP. For a while James looked around, weighing up all the options, unable to decide which Lambretta would suit him best. After pondering over several models the choice was finally made, a Grand Prix. At the time plenty of good original examples were coming over from Italy and at a fairly reasonable price. 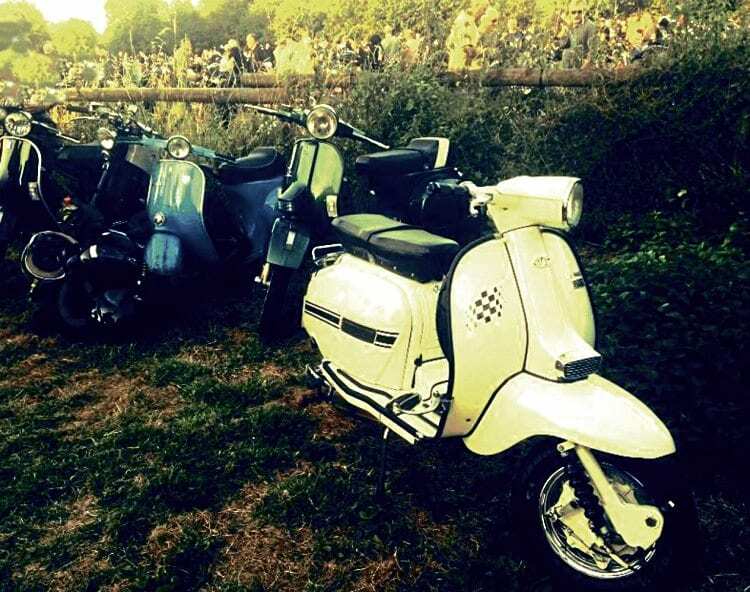 A Lambretta rose among Vespa thorns, allegedly. Deciding on a GP 200 which, though at a slightly higher premium than the smaller capacity models, was still in James acceptable price range. 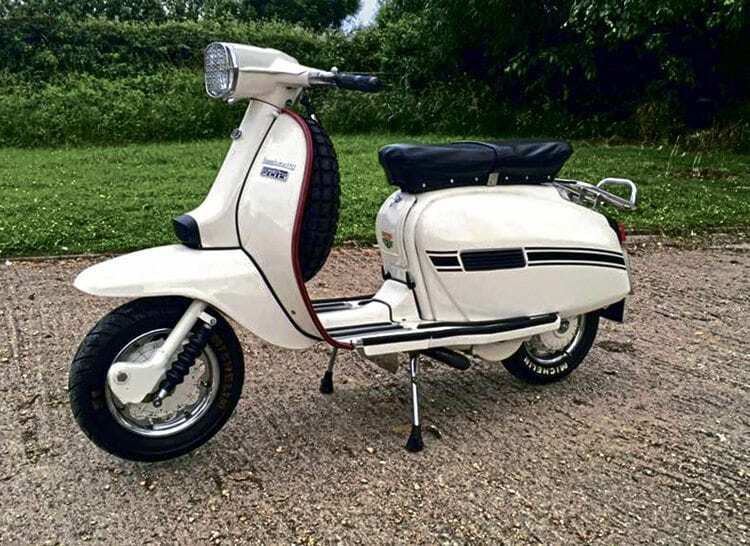 After a visit to Nigel Cox at Weston Scooter Parts, James was ready to purchase a nice unrestored GP 200. However by chance he saw an advert by AF Rayspeed offering a deal on a brand new SIL GP 200. Intrigued by the fact that he would be the first owner and the only name on the log book he decided to follow it up further. The original 90mph speedo still in place and working by all accounts. Having spoken to Ray about what was been offered, James was swayed by what he was told and took the plunge to buy one. The price would be £1900, a similar ball park figure to what second hand Italian examples were fetching. Ray did explain that machines coming in from India were given the once over and would have the crank changed as well as the paintwork touched up as some of it wasn’t up to the standards required. James had decided on choosing the colour white for his new stead which unbeknown to him would mean a delay. The problem had arisen due to availability which had come about as production of the Grand Prix was approaching the end at SIL. With no other choice he patiently waited, in the end a total of six months. To James though it was worth the time and effort as he was getting exactly the Lambretta he had wished for. When it finally arrived, James was contacted and swiftly made the trip to North Yorkshire to pick it up. Again in one of its many guises. James does admit to changing the seat on regular occasions. Ray carefully went through everything that was required, used with correct fuel/ oil ratios and the strict running in period. 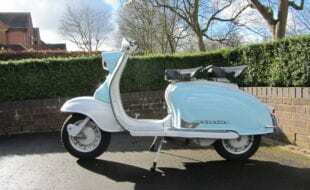 Over the years the SIL Lambretta has come in for some criticism but on the whole they were well built and reliable machines if treated right. James had ordered the famous AF VW 48mm Clubman exhaust which rather strangely was fitted from new before the running in period was done. Along with the exhaust a chrome horn grill, Sprint rack, spare wheel and slope back seat were fitted as per James’ order. 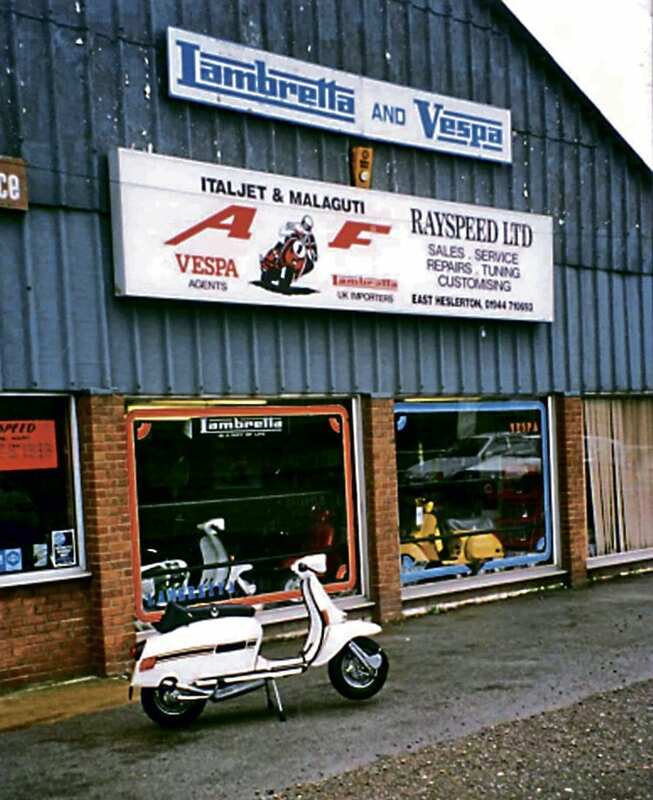 James’ brand new SIL Lambretta Grand Prix 200, waiting to be picked up outside AF Rayspeed in 1997. James stuck to the strict but rather laborious process of running the engine in correctly before starting to open it up. Once it had completed 1500 miles it went back to AF Rayspeed, whereupon Ray Kemp himself personally serviced the machine. Though not used every day, over time James began to clock up several thousand trouble free miles. 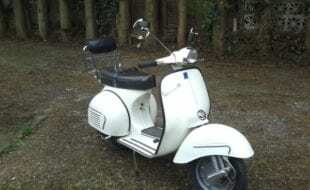 The engine during this period remained completely standard apart from the VW exhaust, just going to show if left to factory specification how reliable a Lambretta can be. Seven years ago, James took the decision to overhaul the machine. It was one that took a lot of thought because once altered the originality was lost. It must be remembered though that he was the only one ever to own it and as far as he was concerned it would stay that way. Over time most scooter riders will either change the appearance of the bodywork or the engine specification. After 13 years of frequent use it was obviously going to need some sort of refurbishment anyway. So as long as it wasn’t going to be too radical there was no harm done. 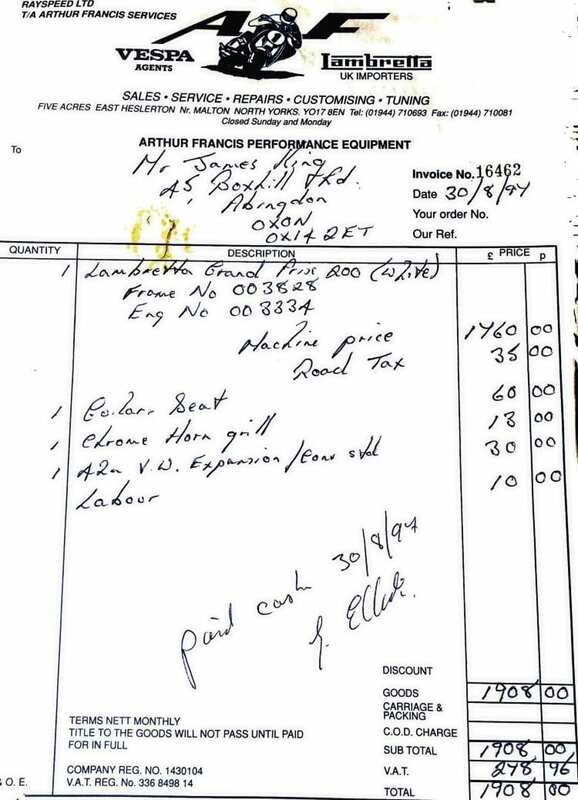 The original receipt for the Lambretta including the extras purchased at the time. The first step was to remove the indicators from the bodywork. 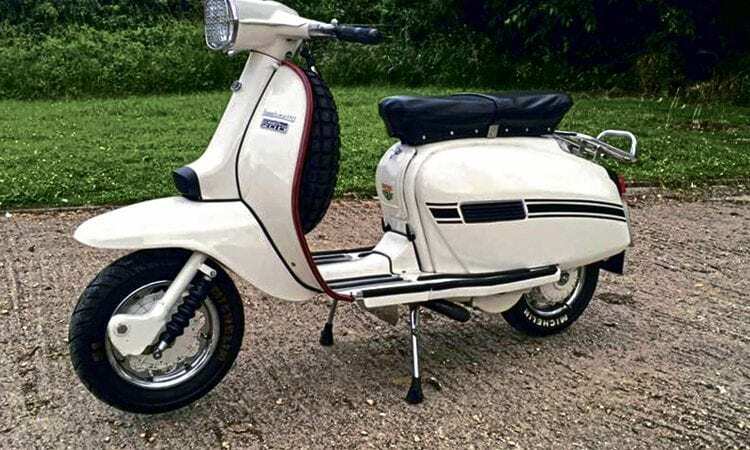 The Lambretta has never looked comfortable with them being fitted and most that were fitted in the factory didn’t remain on the machine for long. It was common for most owners to remove them almost instantly after purchasing. The paintwork was resprayed but James kept the colour the same, meaning there would be no change on the logbook. The engine was still running fine but while it was out of the frame he thought that it may as well be overhauled. The only real change was to that of the top end with a new kit replacing the standard cylinder. 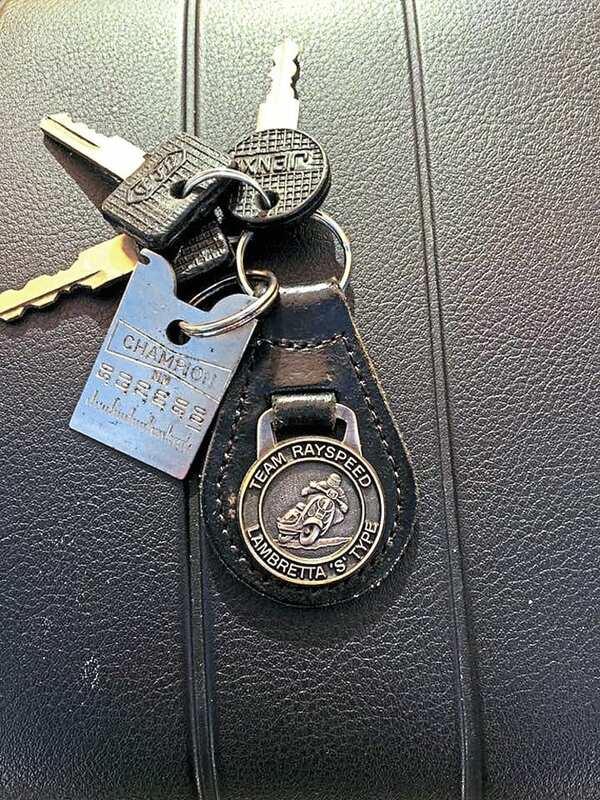 The Lambretta still retains its original keys and keyring supplied by AF Rayspeed. This would be in the shape of the Rapido which is produced by AF Rayspeed anyway. It seemed fitting that any new components that were changed came from the same shop that originally sold the machine. A new identical VW pipe was also fitted, replacing the by now much older and probably coked up one. Even though the original cylinder was removed James decided to keep it, that way if he wants to revert it back one day he can. It’s now been 20 years since James bought his Lambretta. Though there are probably some who have owned one longer there can’t be many, if any, who can say they have owned one from new. Over the time he has received many offers for it but has never been tempted to sell. Down by the lake. You must feel sorry for the family of ducks to the left, about to be assaulted by the cacophony of noise created by the VW pipe. 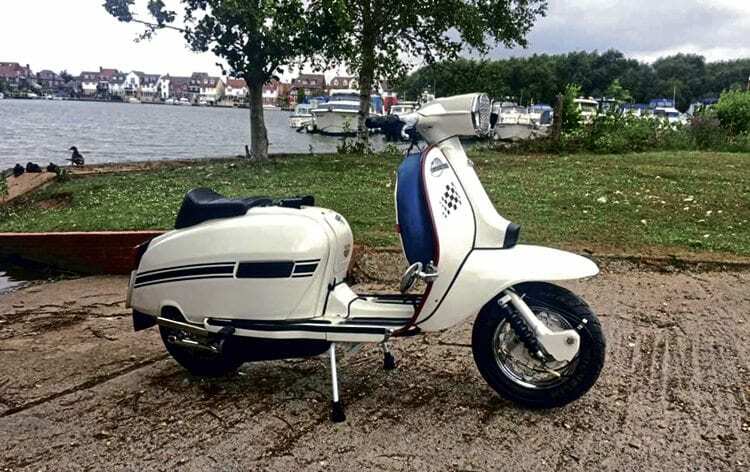 Despite owning several other scooters, notably a Rallymaster and immaculate LD, the GP is still regularly used. This is important as just locking it away in a shed would be a waste. 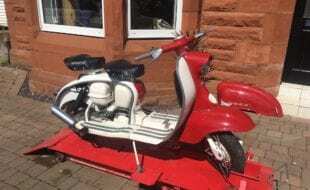 He bought it as a mode of transport and for his passion of the Lambretta, intending to keep it on the road as long as possible. Inevitably the GP will need another overhaul or rebuild at some point. That doesn’t matter though, whatever shape or form it takes in the future James King will still be its only owner. James out and about on his loyal companion of 20 years or more. Scooters India Limited (SIL) bought the rights to the Grand Prix Lambretta in 1971. The firm purchased the name and production line from British Leyland after a buyout of Innocenti the same year. Production of the SIL Grand Prix started soon afterwards but wasn’t sold back in to the UK for several years. 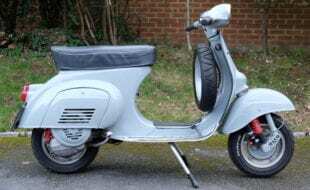 In 1978 Two Four accessories took over importation of the Grand Prix Lambretta in to the UK. 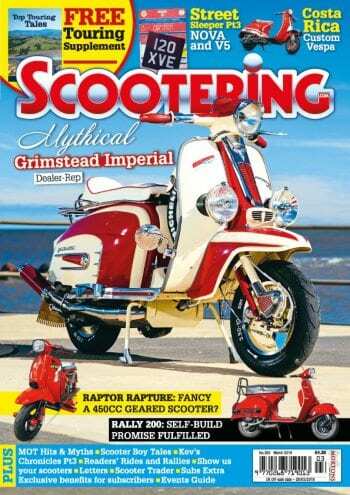 They hired Bob Wilkinson the ex Lambretta Concessionaires public relations officer to promote it. Despite all attempts it struggled to gain a foothold in the two wheeled market as technology had moved on. The Grand Prix was an aging design and though it would appeal to the younger generation was never going to appeal to the masses. AF Rayspeed would take over as the official importer and it stayed that way until SIL stopped production of the GP in the late 1980s. It was rumoured that AF Rayspeed along with several other dealers tried to buy the production line to continue manufacturing GPs but sadly it never happened. 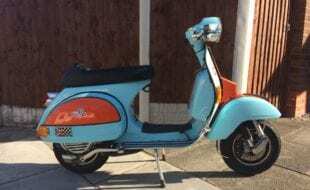 In the 1990s SIL leased the Lambretta name out, whereupon several franchises used it most famously for the Lambretta clothing brand. 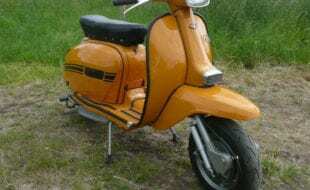 For one season, the Lambretta name was used in Moto 3, a support round of the MotoGP World Series. 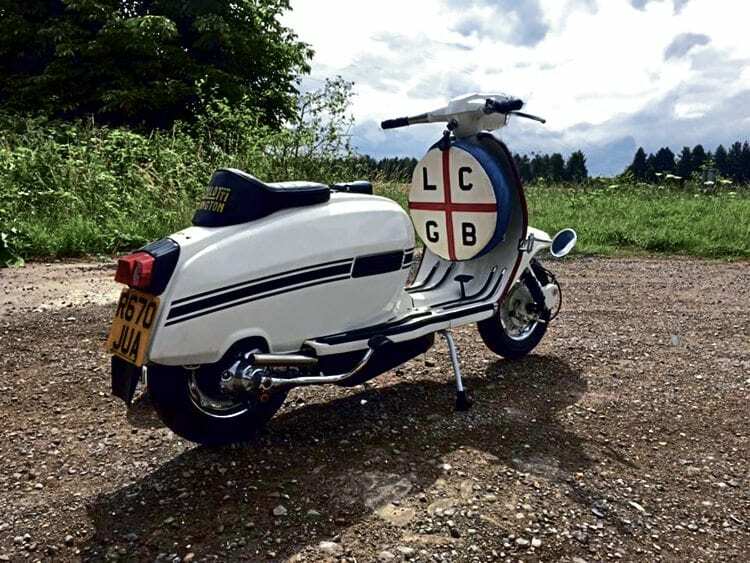 Soon after it was leased out, a bitter legal battle over use of the Lambretta name between the leaseholder and the LCGB ensued over who could or couldn’t use it. 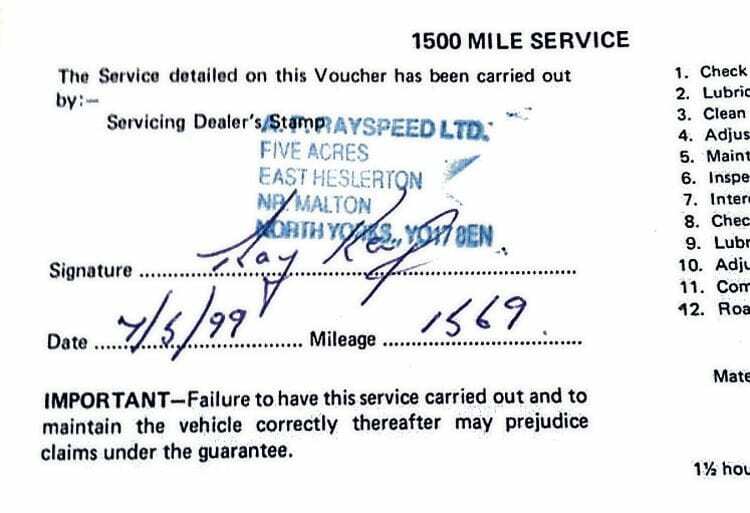 The service slip signed by Ray himself after 1500 miles’ use, even though it has not been back since. 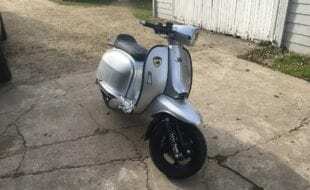 Are you the only ever owner of a Lambretta or any other scooter for that matter, one that you have owned for more than 20 years regardless of whether it has been changed over time? If so drop us a line, we would like to hear about it.